This pasta dish is a fantastic alternative to the classic “Spaghetti & Tomato Sauce”. It’s light but incredibly rich and even more importantly, it’s ridiculously easy to make. The lemon and tarragon means this pasta dish would also work really well with lobster or crab instead of prawns or even just with the mushrooms if you’re not a seafood fan. 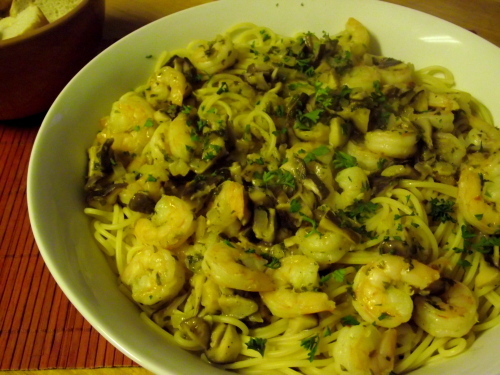 In a large skillet on medium heat saute onions, garlic & mushrooms in butter and olive oil until mushrooms lose their moisture (about 10 minutes) Add prawns, tarragon, pepper, lemon zest and juice and saute for 5 minutes. Add chicken stock and bring to a quick boil. Toss with spaghetti noodles, garnish with parsley and serve with fresh bread.